I wanted to write this post yesterday but just couldn't seem to find the words. I was also busy spending the day with my darling daughter and awesome husband. Shaun had the entire weekend off which was a BIG blessing (weekends off are few and far between). Shaun made me breakfast, I took a bubble bath, and we spent the day just spending time together as a family. It was lovely. 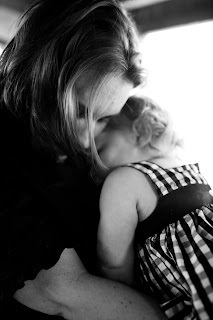 I thought about the day, Mother's Day, and what it means to me to now be a mother. The journey to becoming a mother was a difficult one for me. I wanted nothing more. Shaun and I waited to start trying until we felt that we were really ready. The problem was once we started trying it didn't happen right away. I didn't understand why. I questioned whether we had waited too long. We did some testing. The Dr. told us that he could find no reason why we should not be getting pregnant. I went into crazy temperature-taking, charting mode. It still didn't happen. Finally, almost a year into trying, I got the positive test. We were ecstatic. We shared our news with all of our family and friends but then lost our baby at 9 weeks. We were devastated. I laid on the couch for a week crying over what might have been. We went to the Dr. and he told us to wait one month and then start trying again because women who have miscarriages will likely get pregnant again right away. I stopped charting, stopped taking my temperature every morning. I was tired of letting it run my life. We were moving and had so much going on. We settled into our new home and promptly took a vacation to California to see our families. Just a few weeks after returning, on July 5, 2007, we got another positive test. I was so excited but also terrified at the same time. Would I lose this baby too? It was a constant thought in my head. I was nauseous right away. I remember being thankful for it at the time. I knew that being nauseous was a "good sign". Julianne was born on March 5, 2008, a year to the day after my miscarriage. God took a day that had been horrible for me and made it into the most wonderful memory of my life, the day I became a mother. Being a mother is the most important job I have ever had. For the most part, it has been pretty easy for me. Last week was my most difficult week I have had since becoming a mother (well, maybe not as difficult as the first two of her life but I was so sleep deprived that it is all just a blur...thank goodness). Julianne has been the easiest baby. She is happy, easy to please, and sleeps better than any baby I know. I have been blessed beyond belief. Last week, she was not the baby I have known. She was crabby, she would scream when I walked two feet away from her, she would cry for what seemed to be no reason. Nothing made her happy. She is getting six teeth at once. There were two days last week when I just wanted to scream because I didn't know what to do and I wanted to take her pain away. These are the kinds of days that test mothers. They are the hard days. I'll even admit that I was starting to feel a bit sorry for myself. Then I think about other women who want nothing more than to become a mother, mother's who have lost their precious babies, mother's who have endured hardship beyond belief. I am thankful. Thankful for every day that I am this little girl's mommy. Whether it is a good day or a not so good day. God made me a mother and for that, I am eternally grateful. It's funny how a few bad days can show you how truly blessed you are. I am thankful for the mother's in my life. For my mom, who put up with a lot raising my brother and I. I always felt loved and safe, no matter what. For my grandmothers, one who I spent tons of time with as a child and the other, who I never had the privilege of knowing. For Shaun's mom, who raised an amazing man who is now a wonderful father. For all of my friends who had children before me to show me the way. For all of the women in my life that I am sharing this journey of motherhood with. I hope that you had a wonderful day yesterday and that you had time to reflect on what being a mother means to you. I am beyond thankful for this beautiful girl that I get to hold in my arms everyday. My life will be forever blessed because I am her mother. Happy Mother's Day. :-) As much as I loved being able to celebrate Mother's Day yesterday, for the first time.... I can't wait to actually celebrate it with Rowan in my arms. Julianne is so precious. She is so adorable and you are a wonderful mother. Awww, what a sweet post. It was so fun to be pregnant together and sharing our stories and worries and fun times. Thank God for internet and cell phones, huh?? I can't wait to meet Julianne in person, soon, hopefully! Your blog is adorable, as well as your daughter! Hope you had a great mothers day!